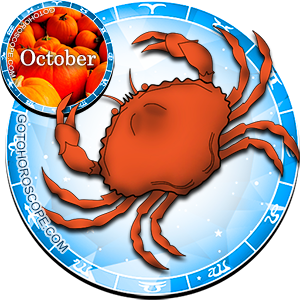 October 2015 Horoscope Cancer, free Monthly Horoscope for October 2015 and Cancer Astrology Forecast for the month ahead. 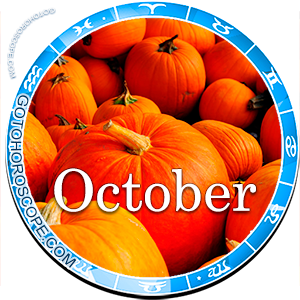 The representative of the cardinal cross of the Water trigon, the zodiac sign of Cancer, is promised the most incredible opportunities by the stars in October 2015, but to achieve the potential happiness in the future, they will have to try very hard in the present. In view of the classical position of Jupiter, the planet-exalt of the sign of Cancer that is responsible for the flowering of its vitality, people born under this sign will not have to jump over their own heads. Everything that happens will be in the framework of their world outlook and policy guidance. On the other hand, Saturn (responsible for the expulsion of the sign) will create a strong enough voltage, a powerful negative flow which will not just focus on one area of life, but will cover a wide range of activities on the life stage. This means that the Cancers will still have to use their wit, wisdom and willpower, so as to not "cave in" under the circumstances and pass all the tests of fate with honor. Mars (responsible for the fall of the sign) will replace the modality of his energy flows and will unite with the Moon, the planet-ruler of Cancer. As a result, this sign will have enough power for any project, but what is more important - it will have new, really strong allies. 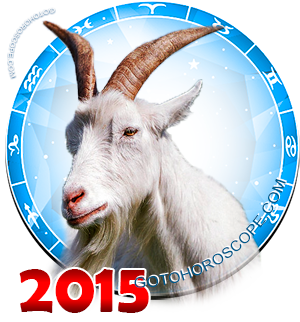 In the area of entrepreneurship and business, the stars will favor Cancers in October 2015. In this case, it is not necessary to start your own business or change your workplace. If such thoughts do come to you, then do not try to actualize them right now, it is better to focus on the pressing problems. Try to give them your best, even if you are not used to it. Work at the limit of your capabilities, but do not go over the limit, or you'll lose everything you have. This is a very important aspect that is worth thinking about for anyone who wants to grow, both professionally and personally. By the way, if the day offers something to learn from someone who is objectively better than you, do not give up this opportunity. Forget about your arrogance and pride, fate gives you a unique chance, not to take an advantage of which would be a big mistake. Those who have their own business, are recommended by the stars to focus on communicating with colleagues and business partners. Now is the time to enter into any agreement that will determine the strategy of your company in the near future. Trust your allies, but do not forget to independently verify all facts of which you speak. In terms of the sensory-emotional sphere in October 2015, you should not trust anyone in particular, including your closest friends and relatives. It is not that they will wish to wreak havoc upon you, quite the opposite - no one will wish you evil, even your oldest and most dedicated enemies. But unconsciously, many of those who are dear to you may interfere with your plans. This means that, firstly, we should not be concealed. Do not hide your desires and potential projects from those who are close to you. Second, October is not the best month for surprises. So if you wanted to commit some rather sudden and an unpredictable act, then either move your plans to a later date, or change them so that you significantly reduce the effect of surprise. Everything should happen consistently and naturally, some sharp spikes and drops only harm you and your environment. Be relaxed and totally free in your judgment, do not adopt someone else's point of view blindly, but analyze it and learn how to separate the wheat from the chaff. It will be your first priority now. i have been to fight the battle of cancer to help people since 2007 thru present for years later.